Paternoster-Row, London : H D Symonds, 1807 A complete set of the Barr edition of Buffon's Natural History, in 10 volumes with 87 plates, 81 of which are hand coloured. 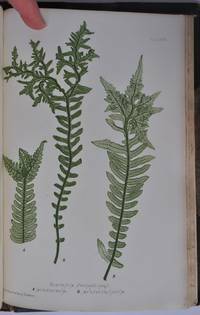 Buffon's Histoire Naturelle, begun in 1749, was read extensively and had a huge influence on later thinking. 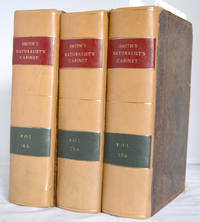 This edition, translated by James Smith Barr, is now rare - although at the time it went through a number of printings. It is illustrated with a number of fine engravings, produced for Barr, and it is now rare to find these hand coloured rather than plain. Each plate has 2 engravings, each showing an animal in its 'natural' surroundings (including domestic dog breeds). 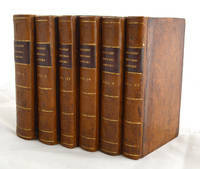 In full leather binding with fairly recent spines with title labels and gilt compartments, and contemporary boards in tree calf. The bindings are in good condition, with some wear to board edges and sometimes a little scuffing to the boards. The original endpapers have been retained and repaired. Small ink signature of John ?Verinder to preliminary page in each volume. The contents are in good condition with slight offsetting/browning around the plates. Some of these are tissue-guarded but these are small guards and not fixed; some of them are crumpled and grubby. There is occasional browning to text pages and some page corners have been turned over just at the edge. Vol I, 1797, 333 pages, frontispiece portrait of Buffon. Vol II, 1797, small brown mark affecting pages 43-47, 348 pp. Vol III, 1807, 4 tinted plates as called for, occasional browning where bus tickets used as page markers, 348 pp. Vol IV, 1807, 1 tinted plate as called for, 352 pp. 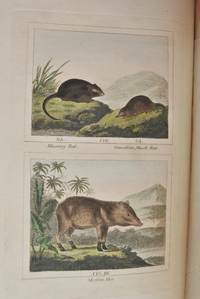 Vol V, 1807, 16 hand coloured plates (although listing calls for 13), 347 pp. Vol VI, 1807, 19 hand coloured plates as called for, 346 pp. Vol VII, 1807, 13 hand coloured plates as called for, title page repaired, 338 pp. Vol VIII, 1807, 18 hand coloured plates as called for, 343 pp. Vol IX, 1807, 15 hand coloured plates as called for, repair to title page, reverse of contents page and final leaf. Vol X, 1807, browning to edges of pages 359-366, 366 pages. A good set.